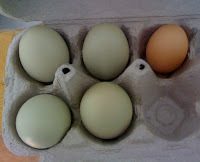 From Stage Dives to Station Wagons: Wordless Wednesday:Eggs! Two of the ladies have started to lay. Chicky Roboto is the all star laying almost every day. 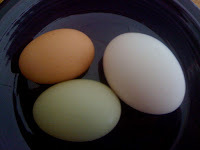 Drumstick has laid one tiny brown egg. The white egg is a Trader Joe's egg to show scale. Yeah, I know, this isn't completely wordless. S0 sue me.